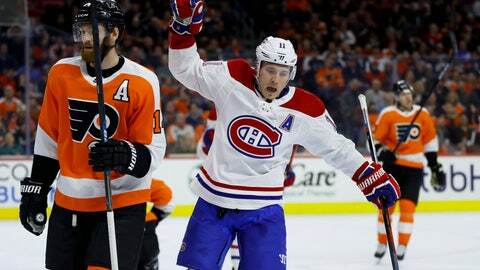 PHILADELPHIA (AP) — Montreal didn’t need all 240 characters to express on Twitter the importance of beating the Flyers: “Les Canadiens remportent une grosse victoire !” In any language, this much was clear for a team making a desperate playoff push, the Canadiens won a big one. “We can win our games, that’s all we can control,” Weber said. But the odds are stacked against the Flyers — just a 2.6 percent chance of making the postseason headed into the game — under interim coach Scott Gordon. Notes: Flyers D Philippe Myers and Samuel Morin were scratched because of illness. … Price made his fifth straight start. … Couturier had his second straight 30-goal season. … The Flyers did not allow Montreal a power-play opportunity, the fifth time they’ve held an opponent without one this season.